As we drove to the airport on our way to an extended weekend in Ranthambore national park, The Family said "We probably won’t see tigers. Let’s think of it as a nice break". She’s been to Ranthambore several times, seen many of the tigers there, and returned with fantastic pictures taken on a dinky little camera. On my only previous trip to Ranthambore I returned with a photo showing the rump of a tiger in bushes by the road: I’d never known it was there. Spotting a tiger is a matter of luck. By going in the wrong season, we knew that luck was against us. The wildlife sanctuary is one of the oldest in India: the erstwhile Maharaja of Jaipur donated his hunting park to the nation, and it was made into a sanctuary in 1955. It gets its name from the Ranthambore hill fort inside its current boundary. The fort is about a thousand years old (although its origins are disputed), and currently on the UNESCO world heritage list. The park is now 392 square km in area, and tourism is allowed in only a small fraction of this. The parts of a sanctuary where tourists are not allowed is called the core area. Among the large national parks, Ranthambore has a fairly small core area. In spite of this, the effort has been fairly successful. When we talked to drivers, guards or shopkeepers, we were told of new tiger cubs, three year olds, and the death of the iconic tiger Machli. On my first visit to Ranthambore, I’d met the legendary conservation worker, Fateh Singh Rathore. At that time I heard from him the idea that the stakeholders in wildlife conservation are the local people as well as the wider public, and that only a partnership of the two can succeed. The organization he was part of, Tiger Watch, has clearly been successful in the effort to involve the community in conservation. The locality seems to be fully invested in this effort now, and earns good money though tourism. Tiger conservation is a rallying cry: because a tiger is an apex predator, you cannot preserve it in the wild without preserving its environment. Contact with humans changes animal behaviour. I saw one example of this in the Mizo hills, where unchecked hunting has depleted the hills of birds, and made them extremely wary of humans. I saw the opposite here, where treepies land on humans to beg for food. Neither of these is natural behaviour. 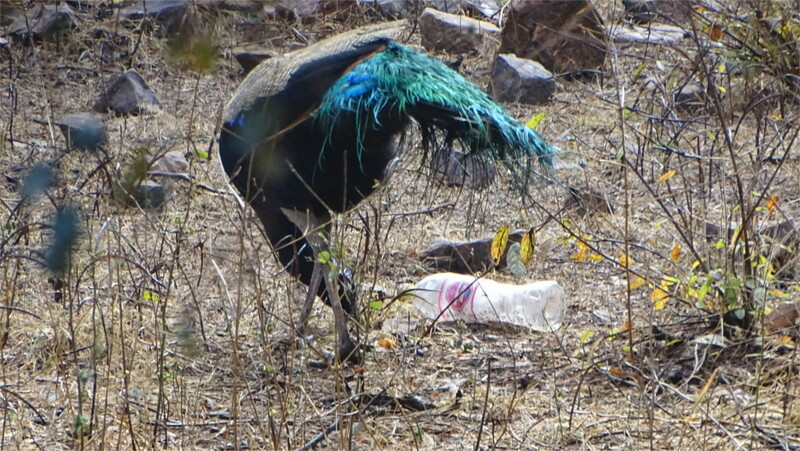 The problem of plastic trash is strong: the photo of the peacock which you see above was taken inside the park. Conservation workers are aware of this problem, which is why tourism is not allowed inside the relatively large core area of these sanctuaries. The Family was right. We travelled in the large cantors, which take about twenty people. Tourists are becoming very responsible now: people talked in undertones, keeping absolutely quiet when the guide called for silence, there were no attempts to feed animals, and there was no littering. We saw no tigers or leopards, although there was at least one sighting every day while we were in the park. We sat at firesides every evening, and listened, enchanted, to the stories of the people who had seen tigers that day. We enjoyed ourselves, and returned with a reasonable bird list. 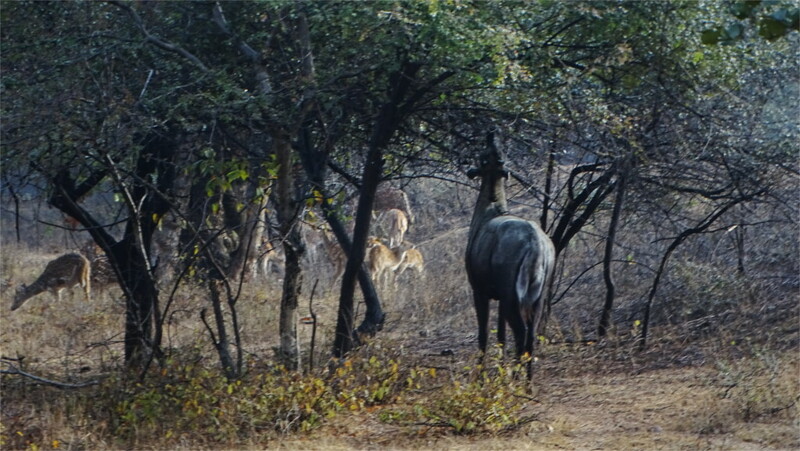 The only group of Sambar deer we saw in Ranthambore was the one in the featured photo. Of the group of four, the three in front seemed to be a mother and her two young. The one in the background looks like another adult female. The group was aware of us, but they continued to feed. The female at the back occasionally lifted her front feet off the ground to reach for hanging leaves. Although we did not see any male Sambar, they were definitely around. Every day we heard alarm calls of lone Sambar: a short bark repeated periodically. These alarm calls signify a tiger or a leopard in the neighbourhood. I learnt a bit of jungle lore from one of the guides. Apparently Sambar keep making these alarm calls as long as the tiger is on the move. When it sits down, the calls cease, but the Sambar keeps a watch and calls again when the tiger starts moving. We tracked the movement of a predator this way once. It seemed to have been fairly close to the road when we heard the alarm call of the Sambar first, but then it gradually moved away and we lost it. The unseen predator was reluctant to move away, because it hunkered down several times before giving up and vanishing into the forest. It was probably a leopard, because we were near a leopard’s kill. Any place in north India is full of migratory birds at this time of the year, and a forest with lakes is a birdwatcher’s paradise. Unfortunately, in Ranthambore most tourists, and every guide, spend most of their time driving around at high speed looking for tigers. As a result, you tend to miss the birds. The Family, who is a much better birder than me, threw up her hands and refused to look at birds. I was left on my own. I’m a terrible spotter, and certainly from a speeding jeep I could not see any of the little warblers I could hear. The only small bird I saw was very distinctive, and I could later identify it as a common chiffchaff. This was a lifer. Everything else I identified was something I’d already seen before. The one bit of birdwatching where local expertise is really helpful is in spotting owls. Typically, these nest in the same place over years. You could spend a long time looking for the nest, or ask a local. 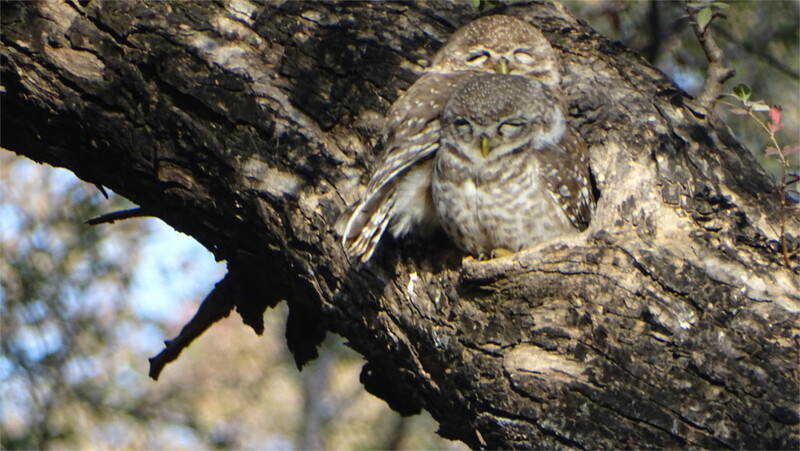 One of our guides knew where to find spotted owlets (above) and a oriental Scops owl. That was handy. One sighting that momentarily energized The Family was of a black headed Ibis. She sat up, looked around and spotted a lump on a tree. We looked closer, and it turned out to be the woolly necked stork which you see in the photo below. From our speeding car we saw a mass of small birds flitting above a field next to the Jaipur-Indore road. They were probably Dusky crag martins, but it was hard to be sure. In far corners of some of my photos there are two more birds: perhaps the Eurasian wigeon and the Northern pintail, but they can be barely made out. I won’t count them in the list. If you observe monkeys, or read accounts by those who do, you’ll find that most of the social life of monkeys centres around grooming. It seems to be as important to monkeys as chatting is to us. I watched the two langurs you can see in the featured photo. The smaller one was initially sitting by itself, when the larger one sauntered by. The smaller was startled, and was ready to run in fright, when the bigger one reached out, pulled it down and began to groom it. 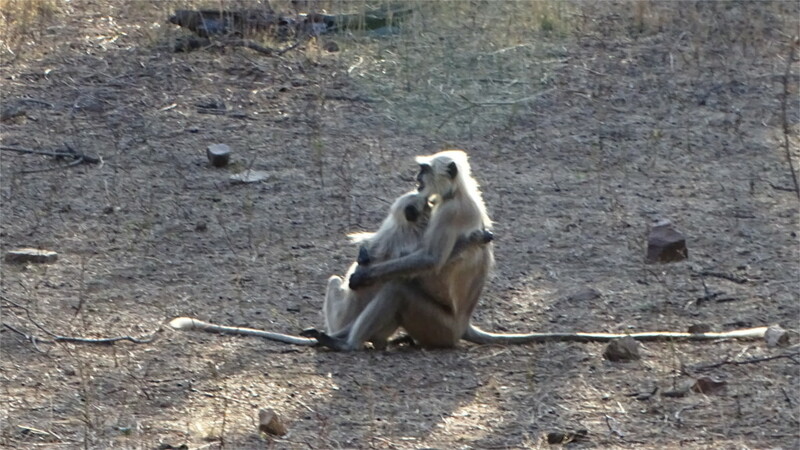 These gray langurs, sometimes called hanuman langurs, have been studied extensively. Much is known of their genetics and social structure. Still, interesting new material comes to light from amateur observation of these herbivorous monkeys. Many interesting new observations are of deception. I wasn’t lucky enough to see anything as interesting as this. If you spend even a little time in an Indian forest you cannot fail to see an association of Cheetal and langurs. Of course, if amateurs and tourists can spot this, professionals must be writing papers about it. The bottom line seems to be that Cheetal gain from staying around langurs. We stopped to watch the deer, but my attention turned to the monkeys. After the first incident, which I described above, I saw many more pairs grooming each other. Another encounter was also startling. A smaller monkey ran towards a larger one and hugged it (as you see in the photo). The larger one then started grooming the smaller one. What was it? Mother and older child? Monkey behaviour is complex enough to be endlessly fascinating. Nilgai (meaning blue cow) and wild boars are original residents of India. I’ve seen paintings of both these animals in the Bhimbetka caves, so they have been part of the landscape around the earliest humans in India. For all that, they are not very dense on the ground. So one tends to stop and admire them when one comes across an individual. 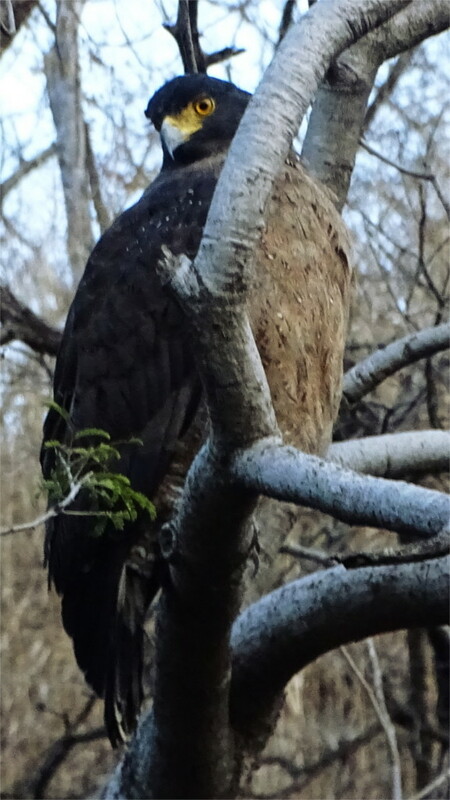 In Ranthambore I saw a single large male almost as soon as we entered the park. The stately, slaty blue antelope was foraging at the periphery of a herd of Cheetal. The scene was quietly beautiful: the yellow-brown coats of the Cheetal were lit up in the morning sun, whereas the darker Nilgai stood in the shadows of the trees. 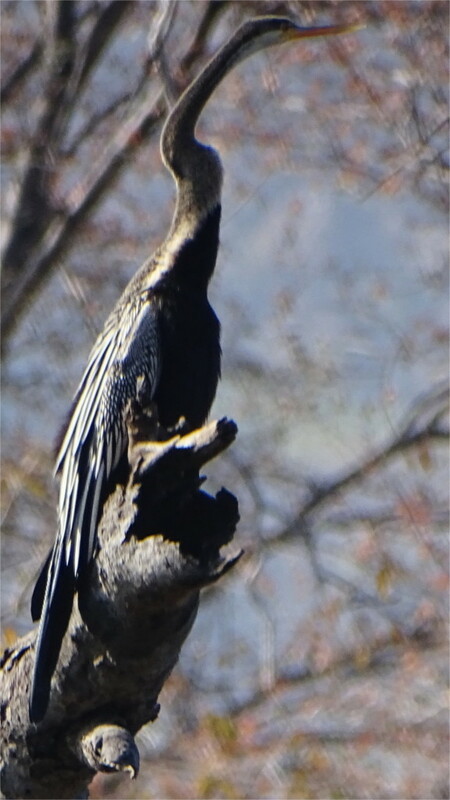 As I watched the Nilgai craned its neck up to browse on the low branches of the tree near it. I saw it eating the woody twigs along with leaves and recalled news stories of man-animal conflict because Nilgai ate up crops. Nilgai population outside of these protected areas is very sparse. So talk of Nilgai destroying crops over large areas sounds like a lame excuse to hunt a protected animal. In recent years the decline in Nilgai populations has reversed, but recent decisions to allow their killing could easily endanger them again. I was happy standing with a group of people gawking at this animal out of our history in such a peaceful setting. In my mind Cheetal is always associated with the following bad joke: "When is a spotted deer spotted? Only after you spot it, of course." 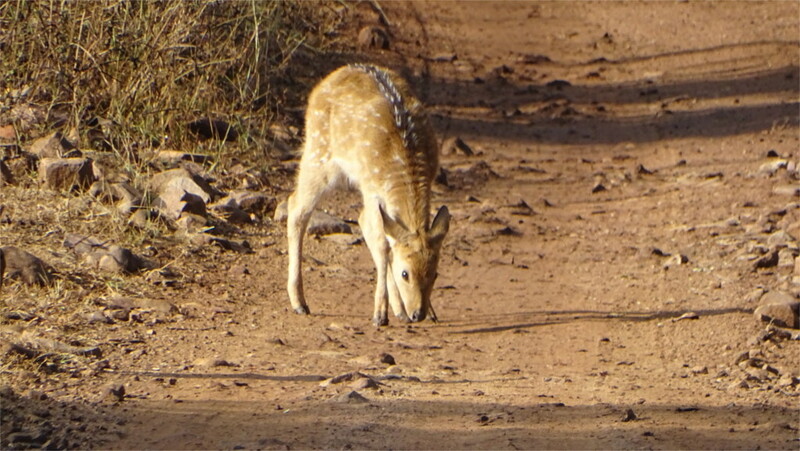 In fact it is born spotted, as you can see from the photo of the very young fawn below. The jungles of Ranthambore resonated with the agonized call of Cheetal that we came to recognize as the male’s rutting call. All the adult and adolescent males sported full grown antlers. Interestingly, these fall off and are regrown every year. There were also a number of young and year-old fawns in all the herds that we saw. The cheetal can mate all through the year, so the spread in ages was not unusual. 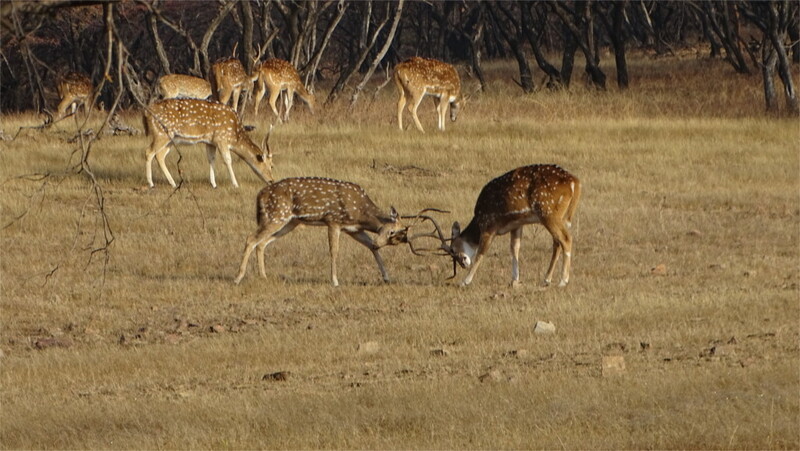 We had a grand view of two adolescent male Cheetal sparring while the dominant male of the herd calmly browsed in the background. The fight did not look serious; the two pushed at each other, and then broke away to continue to browse. I’ve never seen Cheetal badly damaged in a fight, and this is the usual end to a bout. The previous day we had seen a Cheetal carcass. It had been brought down by a leopard, which came back several times to feed. The park is full of Cheetal, so it is not surprising that here this is the main prey for both leopards and tigers. I was right at the back of a large open top vehicle called a cantor (I have no idea why a large jeep is named after a singer). When we came to a halt I was one of the last people to figure out that there was a large number of peafowl on the road. It had rained overnight, and there were several pools of water in the road. The bunch of birds must have tired of the worms and grass seeds it had been foraging on, and come to drink the water. Although peafowl are widespread, I’ve never seen people walk past them without stopping. All twenty of us in the cantor were happy watching these pheasants walking around, drinking water, and generally having a relaxed time. This was not the mating season, so there were none of the fabulous displays that one sees from the male when its trying to attract a female. Off to one side of the road a couple of these dandies were displaying an aloofness that completely disappears in the mating season. 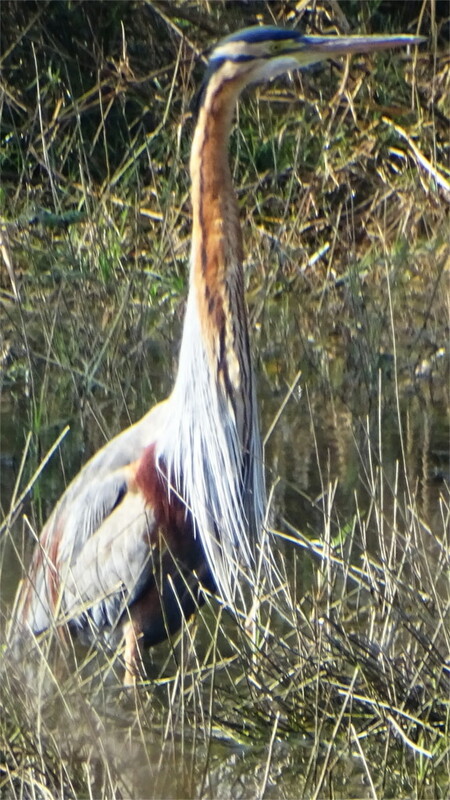 I haven’t seen the red in the plumage before. Since the spectacular blue on the neck, and greens and golds on the tail feathers are all tricks of light (being due to diffraction from the microstructure of the feathers) this colour could be just due to the special angle I happened to see it from. 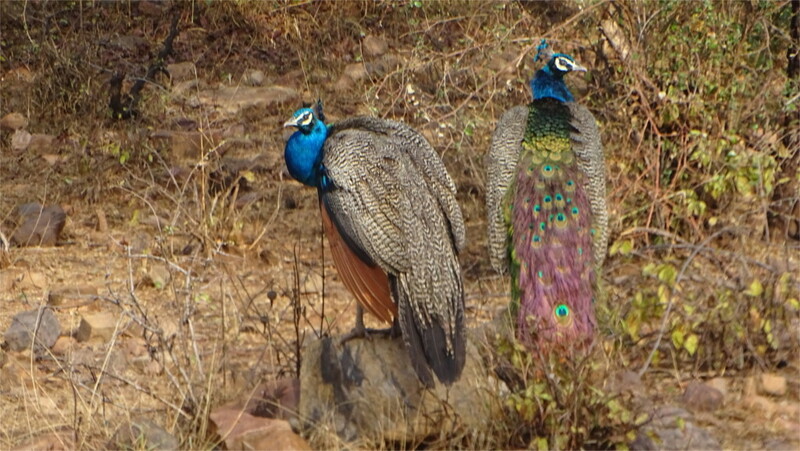 There doesn’t seem to be anything particularly distinctive about peafowl apart from the colours of the male. So why was it chosen to be the national bird of India? Quora has an interesting discussion on this, One day I must read the record of the deliberations of the committee that made this choice. We stopped near a peaceful lake on an afternoon in Ranthambore. It took a little while for us to see the crocodiles lying on the bank: you can see them near the reflected glare of the sun in the photo above. They must have just come out of the water and were basking in the sun, warming themselves again. The Indian fresh water crocodile, also called the mugger, is one of the thirteen species of crocodiles presently found around the world. One of the things about crocodiles that I find really interesting is its jaw. I’ve often seen them sleeping with their mouths open. Apparently this is a way for them to cool off, like the panting of dogs. Their jaws can exert a pressure fifty times more than ours, so for crocodiles biting through a leg is probably as easy as biting through an apple is for us. But they have very little strength in opening their jaws; even a rubber band can keep one from opening. This must be the esoteric knowledge that crocodile wrestlers use. When I saw a crocodile glide through the water (photo above) it was not hard to imagine that it can get to a speed of over 30 Kms an hour. It looks perfectly adapted to the water. It is a very successful hunter, with acute senses: colour vision, smell and hearing. I’ve never had the luck to see a crocodile make a kill, but I’m told it crushes the victim with its jaws and swallows it whole. I’ve also heard that it swallows small stones to help with digestion. This is entirely believable, because some birds do this, and crocodiles are closely related to birds. 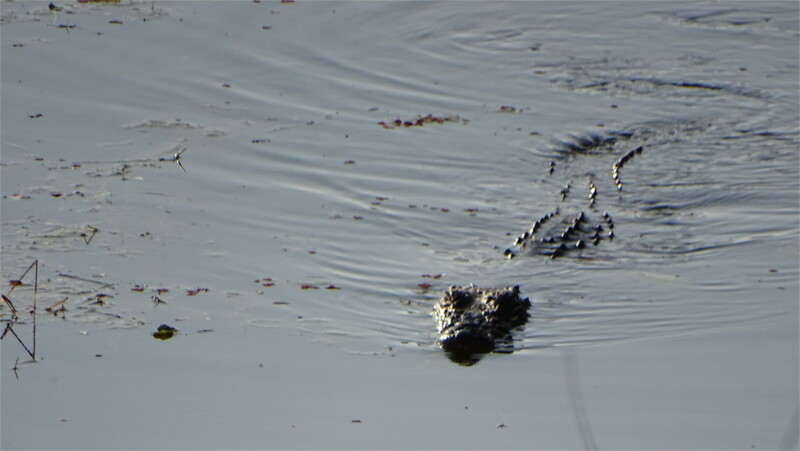 Earlier in the day I’d seen a crocodile motionless on a spit of land jutting out into a lake. Its stomach seemed full. Someone asked whether it had just eaten. No one knew the answer. 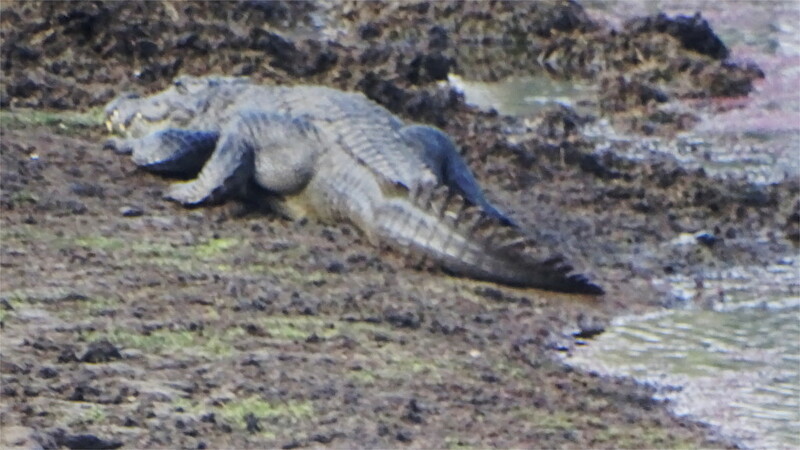 I searched later but could not figure out how long a crocodile takes to digest food. Did we just miss a kill, or had it fed more than a day ago? 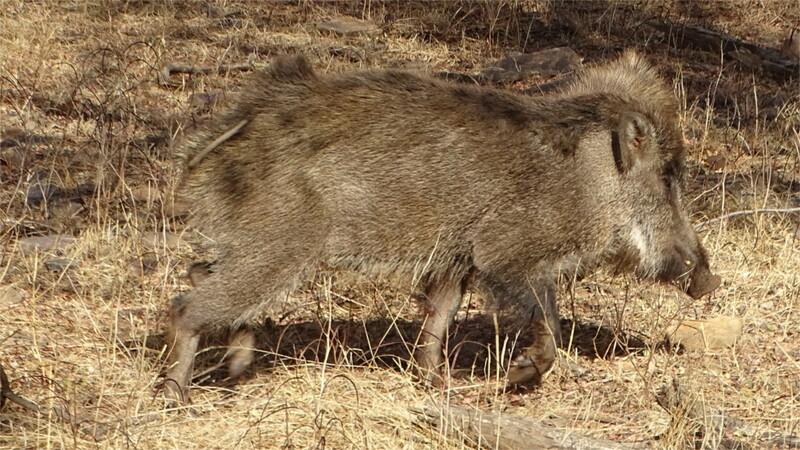 Wild boars are fairly common, so it was strange that I had no photos of these animals at all. I’ve always seen them on the run in wildlife sanctuaries; perfectly understandable behaviour from an animal that is a common prey of the leopards and tigers which are the top predators in these places. This weekend in Ranthambore national park I came across a sounder of boars placidly feeding in a meadow. They kept an eye on us, but did not stop eating. I got plenty of time to photograph these wonderfully social animals. The particular individuals that you see in these photos are of the subspecies called Sus scrofa cristatus (India harbours yet another subspecies). 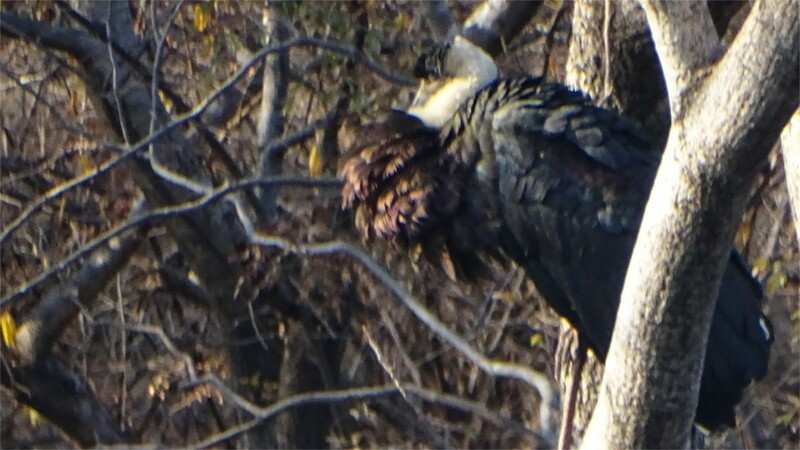 They are omnivores, and have been photographed feeding not only on roots (as here), but also on carrion. This sounder had no tiny squeakers, which probably means either that the mating season is on, or that it is not yet four months past. Since there was no tusked male in sight, I guess the mating season could have finished. As I took photos I wondered about the ease with which these wild animals treated us. This was so different from what I’ve seen before. 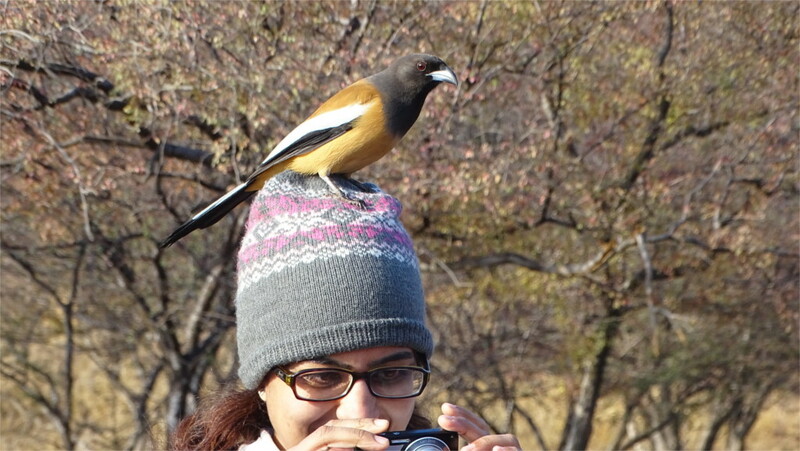 If there is one thing, just one thing, that every visitor remembers about Ranthambore national park, it must be the Rufous Treepie. They are common around the park and inside. The harsh call of a treepie is one of the loudest sounds you hear, and you hear it often. This colourful bird is a member of the crow family: clever, aggressive, not choosy about what it eats, and often flies away with a large amount of food, presumably to store it in a hiding place. When I visit Ranthambore, practically the only thing I’m sure of is that I’ll have a couple of good photos of this bird. Treepies are fairly common across India, and all the way south-east to Vietnam, but they perhaps interact most with humans in this national park. How aggressive is it? The photo above gives you an idea. Inside the park animals are very safe from humans, and some misguided tourists even feed these birds. The result is that whenever it sees a human it swoops down aggressively for a treat. At times this is dangerous, because monkeys have learnt to pay attention to these calls. Of course, monkeys are more intelligent and aggressive, so the appearance of a treepie is often a prelude to chaos, as a combined troop of treepies and monkeys attack a vehicle full of humans. It turns out that humans are not unintelligent, and in recent years they’ve largely stopped feeding these birds. The fact that they still try to seek food is probably an indication that there are still some humans who continue to distribute packaged food to wild animals. A treepie’s normal diet largely consists of insects and carrion, and a little fruit. I wonder what the transfats and high fructose corn starch from biscuits does to the birds.